Just when we thought that the purse strings to Roman’s rubles had been tied closed with all the endeavour of an over enthusiastic boy scout, Chelsea actually look set to spend some money. During the close season we’re used to seeing Moneybags FC fritter away millions on overpriced, overpaid and over here imports. But, so far, only three free-signings, Claudio Pirazzo, Tal Ben Haim and Steve Sidwell, have been added as understudies to the stars. Although Chelsea’s Â£12m bid for French winger, Florent Malouda, is still short of Lyon’s valuation â€“ not surprising since they managed to milk Â£26m for Michael Essien when Chelsea were still frivolous â€“ it looks like he will be soon be a bleu. Money well spent or is Mourinho just trying to annoy Rafa again? well, i’d like to see malouda going anywhere but chelsea :) btw, can you visit my blog and tell me what you think about it? 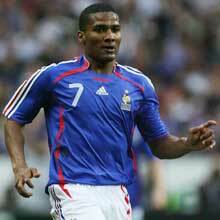 thanks..
Malouda is alread a Bleu. (France NT.) But I guess he may soon be a Blue also. I personally hope not, though. Seeing Malouda playing for Chelsea would break my heart. Where have you got this info from – I haven’t seen or heard anything about it? There has definitely been a bid, but nothing is certain yet. But with Joe Cole, Robben, and SWP did they really need another winger? I’d prefer they’d pick up another central defender or perhaps a decent striker since Shevchenko can’t be counted on and Pizarro is untried in the EPL and will probably need at LEAST one season to find his shooting boots. is silvestre still at lyon?